You Earned It. We'll Help You Keep It! We have the experience and expertise needed to prepare your tax return quickly, accurately and to maximize your refund. We have prepared tens of thousands of returns during the more than 30 years we have been in business. All of our tax preparers are professionals and licensed to prepare returns. We know the current tax laws and stay up-to-date on the complex and rapid developments in the federal and state tax codes. We specialize in tax planning and compliance for individuals, small businesses, trusts, and estates. Maximize Your Tax Refund and Save with these special offers! 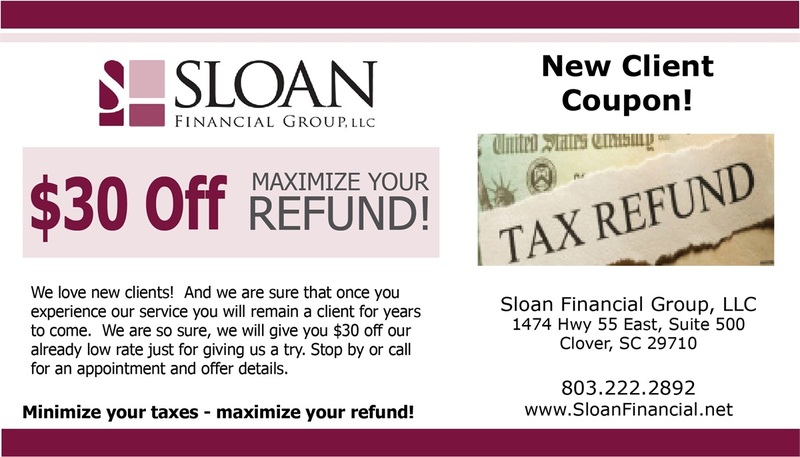 Sloan Financial understands that you need to be able to minimize your tax bill and maximize your refund. We are so sure you will be satisfied with our service we will even give you a special $30 off our already low rate just for trying us. A referral is our highest compliment. Have your taxes prepared by us and share your experience with a friend or family member. 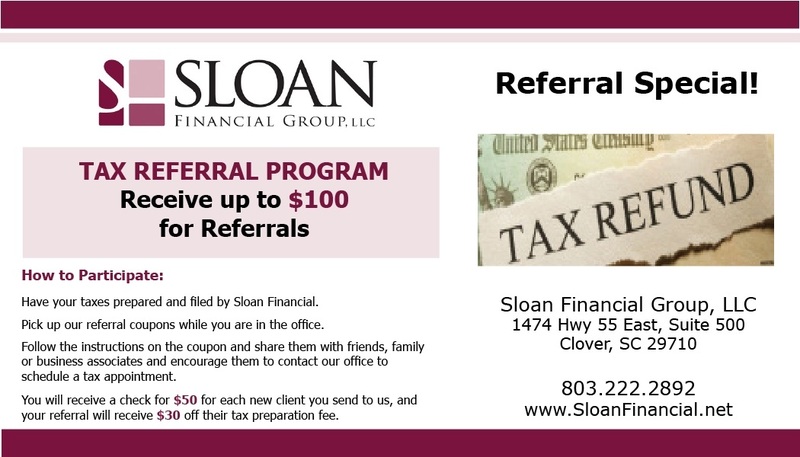 For each person you refer who has their taxes prepared and filed by us, we will send you $50 (up to $100). Plus - we will take $30 off our already low fees to prepare their taxes as a new client.